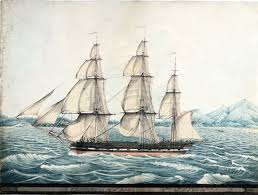 Bound for Port Jackson, New South Wales, and two months at sea, the ‘Isabella’ is making good headway in the South Atlantic, with her human cargo two hundred and fifty convicts. James Baker Waldon, wrongly accused of stealing a pocket handkerchief, is growing accustomed to life aboard a convict ship, taking time to reflect on the past weeks as he takes the first watch. Sitting there for another hour, James eventually heard the fourth bell. Two hours to go, he thought. It was hard to stay awake. The gentle motion of the ship; the sound of the wind in the sails, and the creaking rigging had a hypnotic effect. But if he felt he was nodding off, he would stand and cross the prison to an open scuttle, where he would take several deep breaths. Tonight the moon was full and skimming along over the ocean, a ghostly galleon, keeping pace with the ship. Standing at the scuttle, gazing out to sea, James reflected on the past eight weeks. Everyone had settled into a routine, and in general, life was good. His messmates got on with each other, each person doing their fair share of duties. Similarly, this seemed the case with other messes, with few episodes of quarreling or fighting and everyone sticking to the rules and causing little bother. It had always been Doctor Galloway’s intention that, once the voyage was underway, he would begin a school for the prisoners. As a result, following prayers one morning, after several days at sea, one-half of the prison went below to their lessons, while the rest stayed on deck to take exercise. By reading the records, Galloway was aware of the prisoners who could read and write. Therefore, to help others who were less proficient, he appointed a group of monitors, of which James was one. Before the sanctity of the classroom, the day began at four o’clock, with the prisoner cooks allowed on deck to light fires under the boilers. At half past five, James and the other mess captains carried washtubs on deck and filled them with seawater. Meanwhile, the guards woke the men in the prison and saw they rolled their beds. Then James and the mess captains watched as the prisoners passed their beds through the hatch to the crewmen, who stowed them in the nets. At six o’clock, half the prison were allowed on deck to wash, supervised by their mess captains. Once complete, they returned below, while the remainder came on deck to do the same. 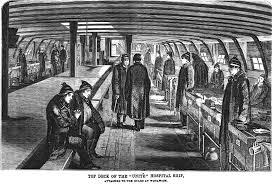 At eight o’clock, while the crewmen swabbed the decks and latrines, the mess captains having collected their mess’ breakfast from the cooks, the prisoners ate their meal, gruel always on the menu. Half an hour later, one man per mess was allowed on deck, where he washed and dried his mess’ bowls and utensils; then returned to the prison. At two bells, all activities stopped for prayers, which was conducted by Doctor Galloway. Then at three bells, thirty minutes later, one-half of the prisoners remained on deck while the other cleaned the prison. By ten o’clock, once the prison was washed and thoroughly aired, the prisoners separated into two groups, one remaining on deck for exercise while the other went below to school. Throughout the morning, Galloway treated the sick and listened to prisoners complaints. Dinner was at twelve o’clock, with half an hour allowed for the usual meal of salt beef or salt pork and peas, followed by suet and raison pudding, one messmate once again washing up the utensils. In the afternoon, the prisoners who were at school in the morning went on deck for exercise, while the others remained below for lessons. At four o’clock, the bedrolls were collected and passed down the hatches. Then it was suppertime, which was more than often another bowl of gruel. At five o’clock, the messmates washed the utensils, and at six, all prisoners were allowed on deck for evening prayers. With the muster taken at seven, at eight o’clock, everyone was sent down and the prison was locked for the night. Hereafter, there was no talking allowed. This daily routine never altered, except on Monday mornings, when James shaved himself and his messmates. Also, one-half of the prisoners came on deck to wash their clothes, the remainder washing theirs on Wednesday. There was no school on Saturday and divine worship on Sunday. Strangely, this strict regimen seemed to bring order out of chaos, because men, who had been wild and quarrelsome at the beginning of the voyage, seemed to thrive under its regularity. Everyone attended school, where they read and memorised stories and passages from the bible. This too was innovative, as the illiterate at the beginning, who were unable to see the value of learning, now realised its importance and worked hard. If he was honest, James was enjoying the experience. As mess captain and monitor, he was busy. Busier, in fact, than ever he had been as a footman at the hall. If not teaching in the school, or overseeing a duty, he was collecting rations, delivering them to his mess, or to the convict cooks on deck.